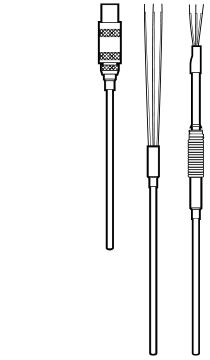 The 1500 and 1600 Series Industrial Temperature Sensors are mineral insulated thermocouple and resistance thermometer assemblies for use up to 1100°C. 1500 Type MT 0 - MT 6 – Mineral-insulated Thermocouple assembly MT. Use for temperature measurement where flexible, rugged, corrosive resistant, fast responding sensors are needed. Solid, fluid, and gaseous media to 1100°C. 1600 Type MM 1 - MM 5 – Mineral-insulated Resistance Thermometer. Use for temperature measurement where flexible, rugged, corrosive resistant, fast responding sensors are needed. Solid, fluid, and gaseous media to 600°C.